It’s January so I figured I’d publicly share my list of things I’d like to accomplish this year! 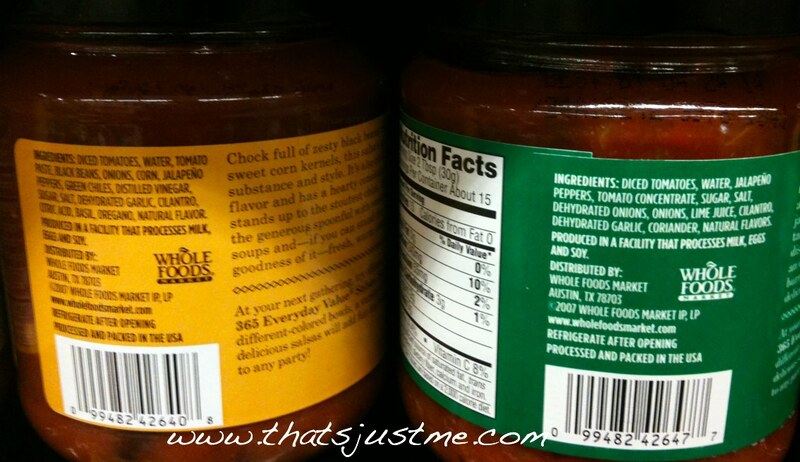 While shopping at Whole Foods Market this morning, on the salsa shelves, I noticed that only two of the Whole Foods 365 brand (non-organic) salsa were verified by the Non GMO project. Hmm, why only two? What was up with the 4 or 5 other flavors? Hmm, no actual tequila in this salsa? Funny, must be in the “natural flavors” sigh. Anyway, my point is, Whole Foods Market makes such a big fuss over a selected few products being verified for the non-GMO project, but in reality, most of their non-organic products don’t qualify! 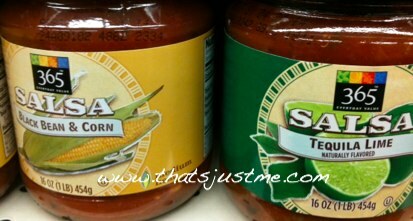 Why only 2 flavors of salsa? Why not take the extra step and use non-GMO ingredients for all flavors? It’s not that difficult to do. Maybe it’s a marketing ploy. (It’s how Kashi/Kelloggs plays.) If WF verifies only 2 flavors out of 6, maybe when the customer sees the little “non-GMO Project Verified” tag, they won’t notice or realize the other flavors don’t meet non-GMO standards. Or maybe it’s just that they need to keep their prices as low as possible, trying to distance themselves from the “Whole Paycheck” moniker. But while keeping their prices are low, are they any better than General Mills or Kraft? Sadly, no. Whole Foods Market is getting more and more like conventional Big Food every day. Years ago, Whole Foods Market used to mean trust-worthy, quality, safe ingredients. It’s unfortunate that they are slowly sliding away from those qualities for more profits and sales. See all posts in my Whole Foods Wake-up series. I was looking forward to watching the new highly marketed ABC show “The Taste.” It’s food network meets The Voice. The premise is four judges (Anthony Bourdain, Nigella Lawson, Ludo Lefebvre, and Brian Malarkey) blind-taste a one-bite morsel and decide if that cook belongs on their team of four. Only after the judges decide yes or no, is the cook revealed. (S)he could be a home cook or a professional chef. Judge Tony Bourdain was actually sweet, contrary to how he usually is. I’m surprised they didn’t go for more ratings with making him more Simon Cowell-ish. Nigella was wishy-washy most of the time, which was very disappointing because I love her! Ludo was barely understandable when he spoke and I don’t even know (or care) who Brian Malarkey is! Ha! By the end of the 2 hours, I was bored, paying more attention to my cookbooks from the library. There was hardly any actual cooking shown and per usual in prime time, the show was painfully slow. During the first half hour, only a mere four bites were tasted! Over and over, the judges enjoyed the taste of the dish but declined to say yes. It was frustrating to see a lot of interesting, unique cooks be dismissed. Even stranger, the judges repeatedly expressed remorse, but then the same thing would happen with the next cook. It was getting frustrating because By the time they chose a cook for their team, it seemed like they were picking out of desperation, making some of their choices uninspired and dull. Another peeve was the judges repeatedly told the home cooks not to apologize for being a non-professional. It was as if they were supposed to feel shame about being a lowly home cook! But the worst part of the show was the excessive use of dramatic props. Clunky game show buttons, blinking lights, special effects screens, and sliding doors looked silly and wasted time that could have been used to show more detailed recipes. But then I guess most viewers probably would be bored too much complicated cooking. So yeah, i was not happy with the show. But Surprise! Yes, I will probably keep watching, as long as nothing else was on. I am intrigued by Sarah the food blogger and Lauren, the Mississippi girl living in the trailer park. Next week will be part 2 of auditions and going forward, they’ll start the actual competition. I’ll give it a little more time and see if it’ll perk up my interest. I admit I was one of the biggest Whole Foods Market groupies. Visiting to one of their stores was like going to church. But the delusion is over, at least for me. I still shop there, but my eyes are open and I diligently read labels. I think what really set me over the edge was California’s Prop 37 for Genetically Modified (GMO) food labeling and the fact that Whole Foods Market was virtually silent. They pretended to care at the last minute, but Really! Whole Foods doesn’t want GMO labeling any more than other Big Food companies like General Mills, Kelloggs, and Pepsi. If a law like that passed, they would be forced to share with all of us (including their millions of blind-trusting shoppers) that a good chunk of their products do indeed include GMO ingredients. Case in point, their 365 house-brand ketchup. A few days ago, I noticed their organic ketchup had the “Non GMO Verified” paper tag under it. Well duh! It’s organic! GMO ingredients are not allowed in any organic foods, so it’s really irrelevant, but that verification label sure does look good, doesn’t it? 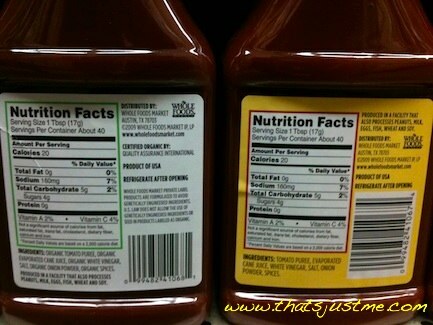 Then I glanced to the left, and noticed the non-organic Ketchup did not have the certified GMO free tag. Hmm, why? What’s in ketchup that could be GMO? And there it was: Distilled White Vinegar, made from cheap GMO corn. 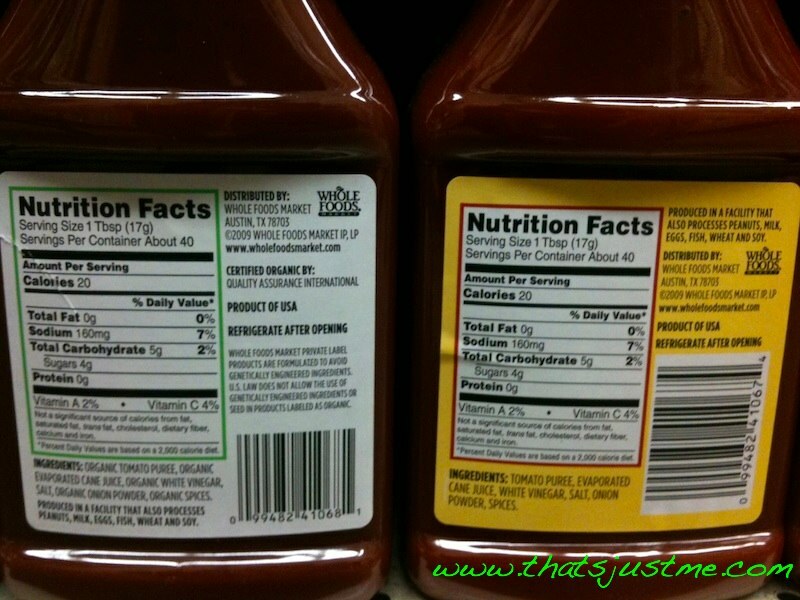 Notice that only the organic version has the little blurb about how their “private label products are formulated to avoid genetically engineered ingredients” – those words are missing from the label on their regular ketchup. What I’d like to know are are there any non-organic 365 branded foods that are GMO Free? And I don’t mean single-ingredient foods like rice or beans. I’d like to see a 365 product that specifically includes some form of corn or soy that is on their Non-GMO verified list. Perhaps there is one, perhaps there isn’t. I’ll be sure to keep looking! When Did Chicken Stock Stop Being a “Whole Food” at Whole Foods Market? Over the last year or so, I’ve been slowly losing confidence in the integrity of Whole Foods Market. Their product ingredients are gradually becoming more and more similar to the Big Food ingredients that a lot of us are trying to avoid. 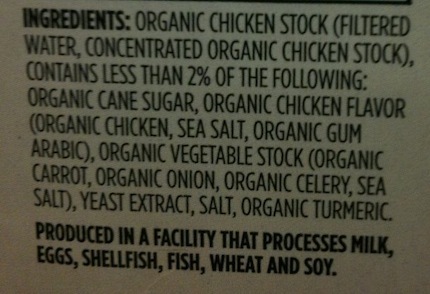 Today I noticed the ingredients in their low sodium chicken stock. When did chicken stock become such a complicated recipe? Were these always the ingredients in their chicken stock? A few months ago, I might not have noticed or thought twice about any of them, but I guess I’ve become more fussy about what I consider a “whole food” — I don’t believe sugar, gums and yeast extract (hidden MSG) belong in my chicken soup. sigh. It’s become more important than ever to scrutinize ALL labels and ingredients, especially when shopping at Whole Foods Market. Gone are the idealistic days of blind trust, assuming they have our backs when it comes to natural wholesome foods. Thankfully I try to make my own stocks, but it’s nice to keep a carton in the pantry; this time, I left it on the shelf! It was so funny to find this 2008 article from the WF web site: “Myths and Misconceptions: MSG” where they contradict the critics that state certain ingredients like yeast extract are hidden instances of MSG. It’s even more interesting to read the comments from some of their shoppers. 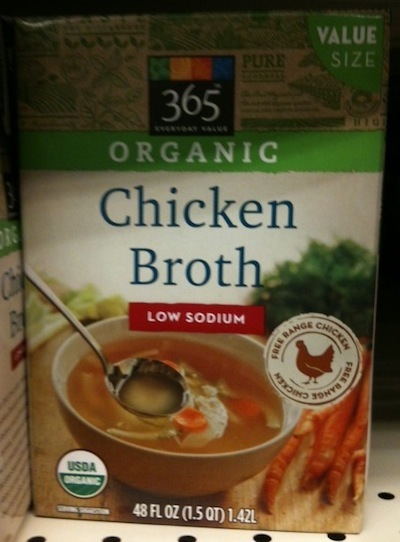 Author debbie @ That's Just MePosted on January 4, 2013 March 2, 2013 Categories FoodTags chicken soup, chicken stock, WFM Wake Up, whole foods, whole foods market4 Comments on When Did Chicken Stock Stop Being a “Whole Food” at Whole Foods Market? Isn’t it funny how we always think that crossing over to January 1st is going to magically change our lives? LOL. I don’t normally encourage New Years Resolutions, but this year, I’m a believer! During the last couple of months, my food/health habits have declined, and my weight has creeped up to 141ish. Take out dinners have taken precedence over home-cooked meals, and that has to STOP! I haven’t been as active as usual, and my back “went out” a few days ago. I feel flabby and gross; I’m addicted to fatty junk foods and sugar again. BUT I’m not considering this to be a failure! I’m moving into 2013 with a fresh attitude. I have great support from my sweet husband and much-needed inspiration from my buddies over at MyFitnessPal.com. $400 Healthy Food Budget: December – End of 2012, Beginning 2013! I thought I’d do much better this month, but “lazy food” choices got the best of me. Our dining out budget was through the roof, but thankfully I’m only $18 over budget for the month! Besides being sluggish about home cooking, I’ve also (temporarily) gained about 6 lbs. But the new year, brings a new outlook! I’ll be back in shape (budget and healthwise) in no time! This should have been an easy month. I’ve learned that seasonal food purchases in cooler months are less expensive than warmer months. I should have been way under budget, but as I said, I succumbed to take-out temptations! 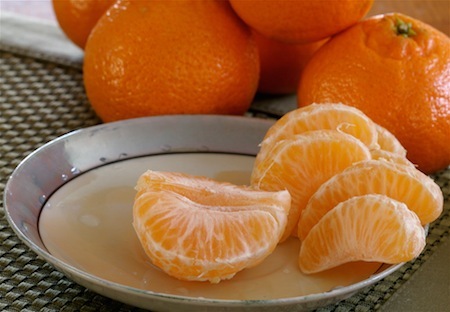 Author debbie @ That's Just MePosted on January 1, 2013 June 3, 2013 Categories Food, Healthy Food BudgetTags budgeting, FOOD, frugal, grocery shopping, healthy, healthy food budgetLeave a comment on $400 Healthy Food Budget: December – End of 2012, Beginning 2013!